Signs of the Times, September 2011. 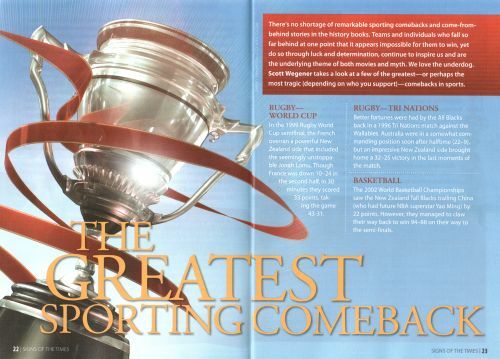 There’s no shortage of remarkable sporting comebacks throughout history. Teams, or individuals, who fall so far behind at one point it seems impossible for them to win - yet through sheer determination, luck or a collapse by their opponents, they do. Down Under has taken part in our fair share of comebacks in the sporting arena, or collapses, as it may be. Here’s but a few of the greatest, and most tragic. In the 1999 Rugby World Cup semifinal the French overran a powerful New Zealand side, which included the seemingly unstoppable Jonah Lomu. Though France was down 10-24 in the second half, in 30 minutes they scored 33 points, taking out the game 43-31. Better fortunes were had by the All Blacks back in a 1996 Tri Nations match against the Wallabies. Australia were in a somewhat commanding position soon after half time (22-9) but an impressive New Zealand side brought home a 32-25 victory in the last moments of the match. In cricket, one of the most remarkable Ashes test comebacks was in 1981. It’s the Third test and, already one Test up in the series, Australia looked to be in the box seat, having scored 401-9, getting England all out for only 174 and then to 135-7 in their ‘follow-on’ innings. However, Ian Botham smashes 149 from 148 balls, taking England’s score to 356, and with Australia only requiring 130 for victory, Bob Willis takes 8-43 to help knock over the Aussies for a mere 111, leveling the series - which England went on to win 3-1. The 2002 World Basketball Championships saw the New Zealand Tall Blacks trailing China, who had future NBA superstar Yao Ming, by 22 points. However, they managed to claw their way back to win 94-88 on their way to the semifinals. In netball, Australia won in the dying second of the match, 42-41, after being 6 points down earlier in the quarter, against the Silver Ferns at the 1999 World Championship netball final. One of the greatest celebrated comebacks in Australian history was when they broke America’s 132-year winning streak in the 1983 America's Cup challenge. Though ailing at 3-1 down, and with history fiercely against them, The Australia II crew won the final three races to be the first to win the cup from the Americans. My all-time favorite against-the-odds win is by Australian Steven Bradbury at the 2002 Winter Olympics at Salt Lake City, USA. After convincingly winning his heat in the 1,000m short-track speed skating , he needed to finish in the top two in his quarter-final race, which included the local favourite and the defending World Champion. While Bradbury only managed to finish third, one of the participants was disqualified for obstructing another racer, so Bradbury advanced to the semi-finals. The semi-final race contained the same scenario, needing to finish in the top two within a field much faster than he was. While Bradbury was skating in last place, three of the other competitors crashed— including the defending champion and a multiple Olympic medallist. This meant Bradbury finished in second place, and is now through to the final. In the fourth and final race, Bradbury ‘only’ needed a third miracle to win a medal. And that’s exactly what happened. This time all four of the other competitors, way out in front of him, crashed on the final corner. Bradbury glided the final 50m for one of sports most unbelievable journeys to a gold medal. All these sporting comebacks are awesome in their own right, unless you were following the team that was overrun. However, it seems Jesus is going to lead the greatest ever sporting comeback. No, I don’t mean ‘sporting’ as in Jesus is going to pop a basketball jersey on and become ‘Air Jesus’. I mean sporting as in ‘generous’ and comeback as in both ‘returning’ and ‘coming from behind to win’. If the prophecies of the second coming of Jesus play out as stated in Bible texts such as Matthew 24:30 “Then the sign of the Son of Man will appear in heaven, and then all the tribes of the earth will mourn, and they will see the Son of Man coming on the clouds of heaven with power and great glory. ", it will be a ‘game’ turnaround far more monumental then any of the comebacks we’ve just looked at. You could easily argue that Satan, captain of the opposing team, has taken a hefty lead in the score of life-on-earth to date. You don’t have to watch television too long to see that Christians are the current underdogs in life. Whether it be a movie that breaks all of the ten commandments before the opening credits have finished, a documentary which claims an authoritative godless explanation of life, to a comedian that makes a mockery of the Bible, complete with laughing audience. It’s hard to see how the Christians can comeback from here. For those who have studied the Bible, especially the meanings of the symbolism in Revelation, one thing is for sure, when that final trumpet does sound, it will be too late to switch teams, and you DO NOT want to be on the losing side; not only out of fear of receiving the consequences, but also the tragedy of missing out on the eternal post-game party for the winners. 1 Corinthians 2:9 "No eye has seen, no ear has heard, no mind has conceived what God has prepared for those who love him"
After wining three consecutive NBA titles with the Chicago Bulls, from 1991 to 1993, Jordan announced his retirement later that year. A brief baseball stint with the Chicago White Sox followed as he pursued his late father’s dream of him becoming a Major League Baseball player. In 1995 Jordan returned to the Bulls, where he led the team to three more consecutive NBA titles from 1996 to 1998. In 1984, Occhilupo was riding high at the top of the ASP (Association of Surfing Professionals ) ratings as a 17-year-old but by 1988 he had turned from vegetarianism and yoga to drugs and alcohol and as he battled weight gain and depression. His gradual decline saw him retiring from professional surfing in the early 1990s. However, in 1995, turning his life around and shaping up from 110kgs to under 80kgs, he re-entered the surfing arena and took out the 1999 world title at the age of 33. After many injuries Kim Clijsters had decided that 2007 would be her last year as a professional tennis player – but had retired early in May due to another injury. Two years later, and only a year after becoming a mother, Clijsters announced her comeback and she played in the 2009 US Open as a wildcard entry where she became the first Wildcard entry to win the tournament. A year later, she successfully defended her US crown and then went on the win the Australian Open four months later.